Ag éirí na gréine agus a chuid ag dul síos, cuimhin linn duit. 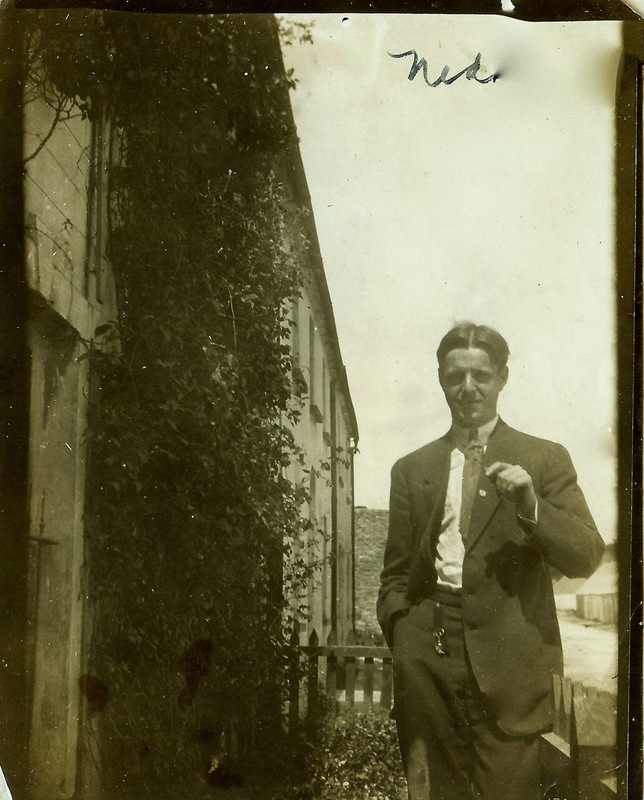 Ned Savage, Ireland, 1913. The exact location is unknown. From Benita (McGinnis) McCormick’s scrapbook. 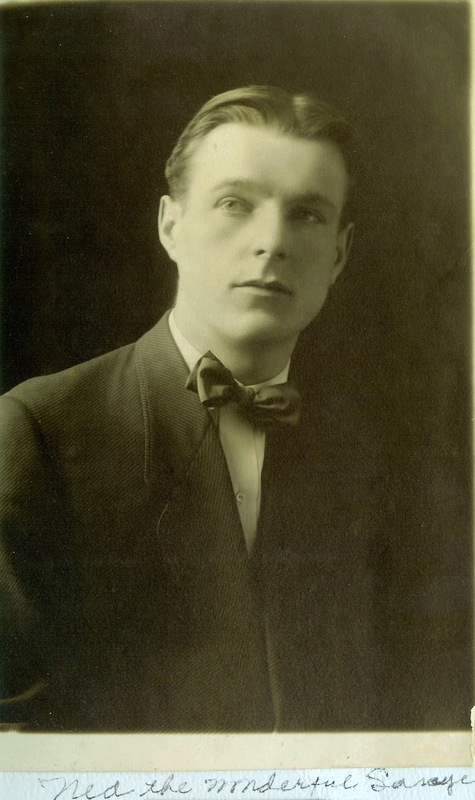 Whether Ned Savage began courting my then 21-year-old great aunt Detty, (Benita Elizabeth McGinnis), during his stay in Chicago in 1910, we will probably never know. But even if they had been just friends, something magical happened during her visit to Ireland in the summer of 1913 that transformed their relationship into a serious romance. I am unable to find how long Ned remained in Chicago, nor any details about his work there beyond what he told the census taker in 1910. In late June of 1911, he sailed alone on the Cunard ocean liner R.M.S. Franconia to Queenstown, Ireland. Among other things, one purpose of his trip may have been to visit his older brother James, who was studying for the priesthood in a Dublin seminary. Ned arrived to an Ireland that was still consumed by its struggle to rise from poverty and secure “home rule,” as independence from Great Britain was called at the time. Weeks before his arrival, a fledgling political group called Sinn Fein (Gaelic for “We” or “We Ourselves”) had burned Union Jacks in Dublin in a symbolic protest of the coronation of England’s King George V.
Ned Savage was one of many young people swept up at the time by the wave of the Gaelic revival and the home rule movement. He must have realized that although he had left Ireland many years before, Ireland had never left him. His passion awakened, he found new purpose in the movement. He joined Sinn Fein and began to study Gaelic. James Savage was ordained to the priesthood in Dublin for his home diocese of Portland, Maine in June of 1913. I do not know if Benita McGinnis was present for the ordination, but Jeremiah and Mary Savage, the brothers’ father and older sister, came from their home in Somerville, Massachusetts. (I have been unable to find any travel records at the time for their other brother, John Joseph; maybe he was unable to come.) The occasion would have been cause for tremendous pride for the entire family, as it was considered a blessing for an Irish family to produce a priest to serve the Lord. 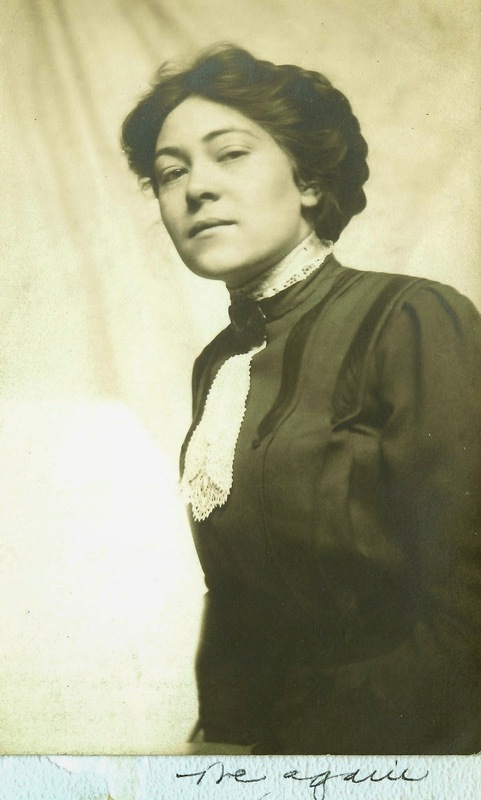 Benita arrived in Ireland during the summer of 1913. From the looks of her scrapbook, Ned showed her around the Éire of his birth and of her grandparents and introduced her to his new friends, many from the popular Gaelic movement. Her scrapbook contains many photographs of Ned. 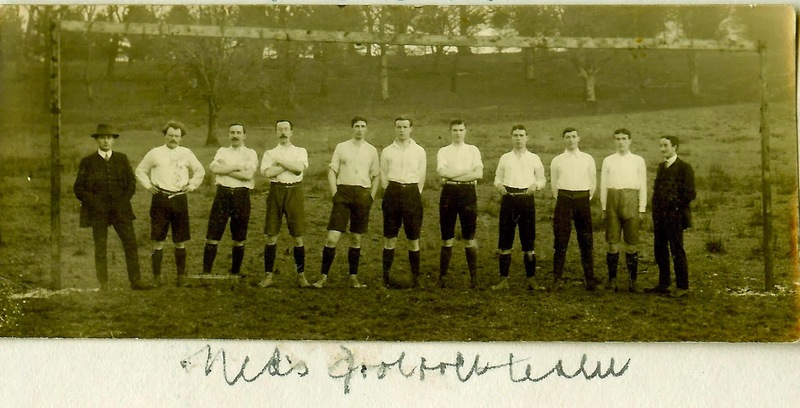 Some are labeled specifically, “Ned in Ireland.” Unfortunately, others such as the one below of him posing with his football team, provide no clues as to the time or place they were taken. in the early 20th century with renewed focus on Irish sport by the Gaelic revival. The photographs depict Ned as an attractive and engaging young man, six feet tall and 150 pounds, fair-skinned and with brown hair, blue eyes, and fine features. (2) According to my aunt, he was also charming, kind, outgoing and idealistic, a natural leader among his peers and the kind of person everyone wanted to know. Some seventy years after their first encounter, she still recalled his soft yet sure Irish lilt that made her want to swoon when he spoke. For her part, Benita, with her intelligent mind, expressive eyes and slender form, had her own independent streak and an artist’s open mind. Confident and witty, creative and stylish, she had a bevy of admirers who loved her ready laugh and unabashed pluckiness. Ned was one of them. again.” From the scrapbook of Benita (McGinnis) McCormick. is right behind him. Ireland, 1913. One can envision Ned and Benita falling under the spell of the sights, sounds, and sensations of an unforgettable Irish summer. The cool veil of the morning mist; the contrast of bright red poppies swaying in green fields, flanked by the endlessness of ancient stone walls that had defied would-be conquerors and harsh elements through the ages; Benita’s breathlessness and the whisper and whoosh of her dress as she moved through the tall grass; the damp smell of a haystack after an afternoon downpour; the comforting heat of a campfire on a windy night, made warmer still by a chorus of young voices echoing the Gaelic songs of their ancestors; the stirring lyricism of a Yeats poem; all of these things made for a magical time for two young people in love. When the time came for Benita to return home to Chicago, she did so reticently, buoyed only by Ned’s proposal of marriage and the promise that he would follow her soon back to America. Bidding goodbye to her “beau,” whom she playfully nicknamed “Ned, the wonderful Savage,” she boarded the R.M.S. Franconia (the same ship that brought Ned to Ireland) on August 19, 1913, at Queenstown, bound for the port of Boston. 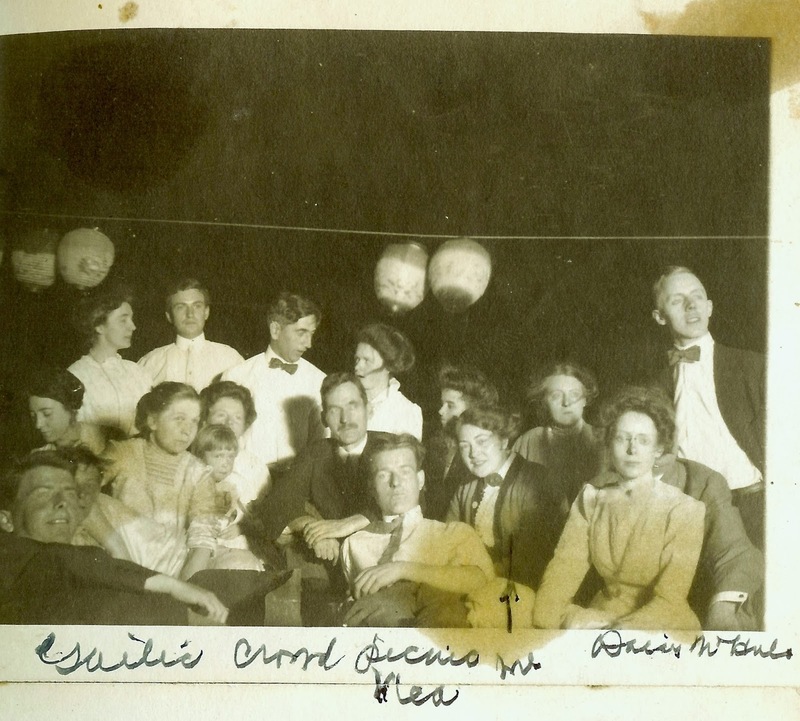 Others traveling with her included her cousin, Eileen Kelly; her friend, Katharine Cronican; and Ned’s father Jeremiah and sister Mary Savage. But Fate had other ideas, and it would be the last time the two young lovers would see one another. As Benita’s wait for her beloved stretched from months into years, she must have wondered, consciously or not, whether his affection for her was eclipsed by his passion for Ireland and it struggle to claim its rightful identity. We do not know what transpired during this period. Remembering that Ned had already been a naturalized American citizen for four years by now, we might expect that he planned to return to the United States eventually and marry Benita. Did he change his mind? Did he think he could marry Benita and bring her back to Ireland to live? Or did he ask her to be patient for a little while longer, while he took care of his unfinished business? 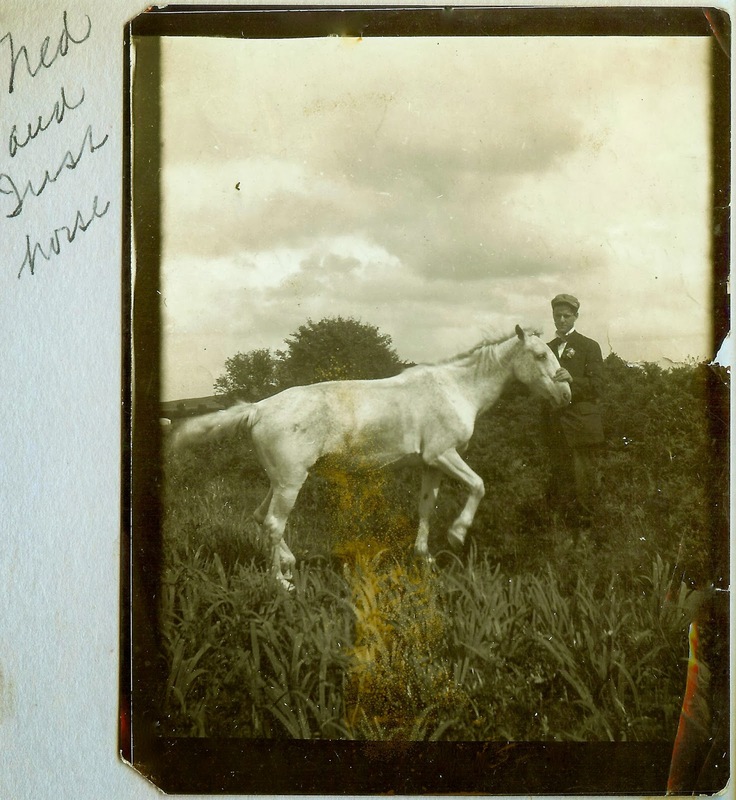 Ned Savage and Irish horse. While living in the Blaskets, Ned fell ill and was diagnosed with Phthisis Pulmonalis – infectious tuberculosis. In the fall of 1914, accompanied by his brother, the recently ordained Father James F. Savage, Ned somehow managed to convince the authorities that he was in good enough health to travel home to Massachusetts. The brothers booked passage on the White Star Line ocean liner S.S. Arabic and docked in Boston on September 30th. Coincidentally, the date happened to be Benita McGinnis’ 25th birthday. As his condition worsened, Ned entered the Lakeville State Sanitorium, a hospital for tubercular patients. He was there for a little over seven months before the same disease that took his mother some 15 years before claimed him, too, in an almost surreal twist of Irish tragedy. He died on October 12, 1915, two weeks after his 29th birthday and a year after he came home. My great aunt talked about Ned a lot, but she never mentioned how she heard of his death. I gather she was back home in Chicago at the time but might have received the news from Mary or Jeremiah Savage. Surrounded and supported by her extended family and many friends in her grief and strengthened by her faith, she eventually moved on with her life. Ned was gone, but he would live on in her memories for the rest of her life, forever young. tuberculosis), from which he had suffered for two years. I think Ned would have been happy to know that Benita married another wonderful young man six years later. He was Phillip C. McCormick, a kind and gentle soul who I knew as my great-uncle Phil. And an amazingly wonderful man he was, indeed. Unlike other men who might have felt threatened by mention of an old suitor, Uncle Phil never seemed bothered by my aunt’s memories of Ned. Instead, he allowed Ned to claim those five years of Aunt Detty’s life, secure in the notion that he was the lucky one who got to share the rest of it. For all he did, all he stood for, and all whose lives he touched, may the memory of Ned Savage’s well-spent life endure. (1) “The Revival of the Irish Language,” by John Fleming. The Irish Fireside, Volume 6, Number 133, 1886. (2) Declaration of Intention for United States Citizenship by Edward Michael Savage, September 11, 1903. 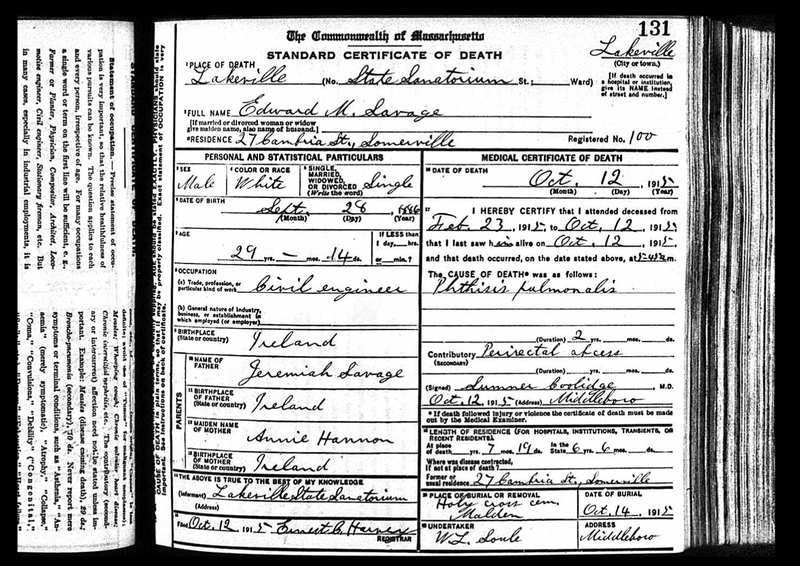 Ancestry.com, Massachusetts Naturalization Records, Originals 1906 – 1929. (3) Letter from John Casey to Margaret Evans, mid-1960s. From Peter Hannan’s account, Edward Michael Savage, 1886 – 1915, February 2014. Wow! I just read your three-part story of Ned and Benita. It was wonderfully written. How tragic that Ned met the same fate as his mother. Tuberculosis was so devastating in those days. My own great-grandmother died of this terrible illness when she was only 26 years old. Linda! I loved reading this! Although I never met Benita, I did cross paths with her through the mail when I wrote to her about who her cousins were in Ireland. She is the one who directed us to her then-deceased cousin's husband – Michael O'Connor. Our first visit in 1981 resulted in a lifelong friendship with Michael and his family. My Uncle Jack (O'Brien) spoke to us often about his friend Bud's (Phil McCormick) family – Benita and Phil and his sister, Jane. I think it's wonderful that you are documenting these people's lives so they are not just a name with some dates next to them!!! Thank you, Jana. Yes, TB took a tragic toll on its victims and their families. Thank God we can now screen for and treat it. What an absolutely wonderful series on Benita and Ned! Your writing is lovely. TB killed some of my family members in the early 1900s, as well. What an unfair fate for young people with so much life ahead of them. I love that you've kept Ned's memory alive with these posts. I enjoyed this series very much! Well done! I'm glad you enjoyed it, Kathy. Thanks for taking the time to comment!